Steve King, a Republican Congressman from Iowa, endorsed Faith Goldy, a candidate for mayor of Toronto. Why would an Iowa Congressman weigh in on the mayor's race in Toronto? Goldy is a white nationalist. For King, this is not out of character. He has a history of embracing white supremacists and espousing racist views. Yes, it's disturbing that there is a Congressional district that is willing to keep sending King back to Congress. (He has been a Congressman since 2002.) But it is even more disturbing that the Republicans' national political leaders not only tolerate but celebrate King. Prominent corporation and trade groups, which tout the importance of diversity, quietly donate thousands to King's political campaigns. Despite his blatant bigotry, King is welcomed by some of the most powerful forces in America. Goldy describes herself as an "ethno-nationalist," who opposes any dilution of Canada's white super-majority. She argued that it "is a natural tribal instinct for human communities to go with their own." Last December, Goldy recited the "14 words," a notorious white supremacist slogan: "We must secure the existence of our people and a future for white children." She was subsequently banned from the crowdfunding platform Patreon for hate speech. Rep. Steve King has a long history of amplifying white supremacists in the U.S. Now he's moved on to Canada, endorsing Faith Goldy, the Toronto mayoral candidate who has proudly recited the white supremacist “14 words” slogan. This is disgraceful. Goldy herself attended the white supremacist march in Charlottesville in the summer of 2017 and, while she was there, appeared on the podcast of the Daily Stormer, a website for neo-Nazis and Holocaust deniers. This April, Goldy recommended a book by a fascist author, Corneliu Codreanu, who advocated "the elimination of Jews." Codreanu has become an icon for the modern white supremacist movement. Goldy will need a significant boost from King's endorsement. She is currently polling at less than 2 percent. King's attraction to a candidate like Goldy is not surprising. The Daily Stormer calls King "an open white nationalist." In June, King retweeted a British neo-Nazi named Mark Collett. In an interview with CNN, King claimed he wasn't aware Collett was a neo-Nazi but had no plans to delete the tweet. He said he agreed with Collett's "message." "I'm not sorry," King said, "I want to see the American civilization strengthened. That means we are a Judeo-Christian country." King previously tweeted white nationalist slogans like "diversity is not our strength." In 2017, King expressed support for a Dutch far-right candidate Geert Wilders, tweeting "You cannot rebuild your civilization with somebody else's babies." Wilders advocates a ban on immigration of non-Western foreigners. Congressman John Lewis (D-GA), a civil rights icon, called King's comment "bigoted and racist." In 2016, King argued on national television that white people had contributed more to civilization than "any other subgroup." He also opposed an effort to put Harriet Tubman on the twenty dollar bill, calling it "racist." In 2015, King criticized Obama because he "apologized to Africa for slavery." "[T]here’s nothing for us to apologize for until they come and thank us for the things we’ve done," King said. In a 2013 interview, King described DREAMers, undocumented immigrants who came to America as children, as drug mules. "For everyone who's a valedictorian, there's another 100 out there that weigh 130 pounds and they’ve got calves the size of cantaloupes because they're hauling 75 pounds of marijuana across the desert," King said in an interview with the right-wing site NewsMax. In 2012, King appeared on a panel with three prominent white nationalists, Bob Vandervoort, John Derbyshire, and Peter Brimelow, on "The Failure of Multiculturalism." King brushed off criticism of the event and told Brimelow, "I've read all your books!" King also keeps a small Confederate flag on his desk, even though Iowa was a Union state during the civil war. Far from being shunned, King has been embraced by top Republican leaders. Just a week ago, Trump singled out King for praise at a rally in Council Bluffs, Iowa. Now, we're thrilled to be joined tonight by a number of terrific Republican leaders. Iowa Congressman Steve King... Where's Steve? Where is he? Where is Steve? Where is he? I wish he could get a little bit more conservative. Can you believe this guy? He may be -- we're all -- he may be the world's most conservative human being. Thank you, Steve. And I supported him long before I became a politician… Thank you, Steve. It's not just Trump. In 2016, Ted Cruz named King a national co-chair of his presidential campaign. "Steve is an incredible leader and fighter for conservative principles. I am very pleased to have him take on this role as national co-chair,” Cruz said. King accompanied Cruz frequently while he was campaigning in Iowa. In the House, King has maintained his seniority and committee assignment. He is currently chairman of the Subcommittee on the Constitution and Civil Justice. As King's rhetoric has become more and more incendiary, Speaker Paul Ryan (R-WI) has stayed mostly silent. After King retweeted a neo-Nazi in June, Ryan said nothing for two weeks. Finally, he issued a vague statement through his press secretary: "The speaker has said many times that Nazis have no place in our politics, and clearly members should not engage with anyone promoting hate." King understood that Ryan's comment was meaningless. "Paul Ryan didn’t say anything. His spokesperson made a general comment that didn’t even have my name in it,” he told CNN. 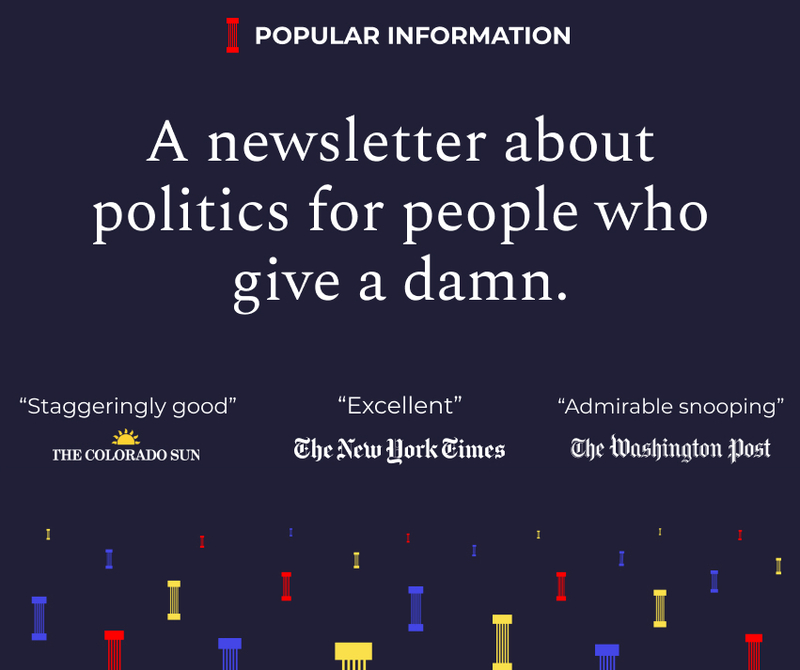 King is locked in a tight battle with a little-known Democratic candidate, J.D. Scholten. A recent poll found King clinging to a 6-point lead, with 43% of the vote. King continues to receive substantial campaign contributions from prominent corporations and trade groups. AT&T ($5,000), Berkshire Hathaway ($2,500), the American Bankers Association ($9,000), Land O’Lakes ($2,500), and Intel ($2,000) all have donated to King's 2018 campaign. King has also received contributions from the PACs of two members of the House Republican leadership, Kevin McCarthy and Steve Scalise. King did not, however, receive the support of his state's most significant paper, the Des Moines Register, which endorsed Scholten. King "won’t debate his opponent and rarely holds public town halls. Instead, he spends his time meeting with fascist leaders in Europe and retweeting neo-Nazis," the Register's editorial board said. Robert Mueller’s investigation, which is focusing on potential obstruction of justice and conspiracy with Russia, is only the beginning of Trump's legal issues. On Wednesday, Trump's former attorney Michael Cohen met "with a group of state and federal law enforcement officials investigating various aspects of President Donald Trump's family business and charitable organization." The involvement of state law enforcement officials, and focus on his business, should be particularly worrisome to Trump. Under New York law, law enforcement officials have broad authority to seek sanctions against Trump's company if it engaged in illegal activity. This includes seeking complete dissolution of the corporation. Cohen's plea deal implicated the Trump Organization. In federal court, Cohen said that he made illegal payments and then was reimbursed for these payments by the Trump organization. The New York Attorney General's office has already filed a civil lawsuit against the Trump Foundation. Trump appears to be worried. In an interview on Tuesday with the AP, he described Cohen as "a PR person who did small legal work, very small legal work." He also accused Cohen of lying under oath. You can't make people pay money to vote anymore. But there is another way to discourage people from voting -- make it cost lots of time. 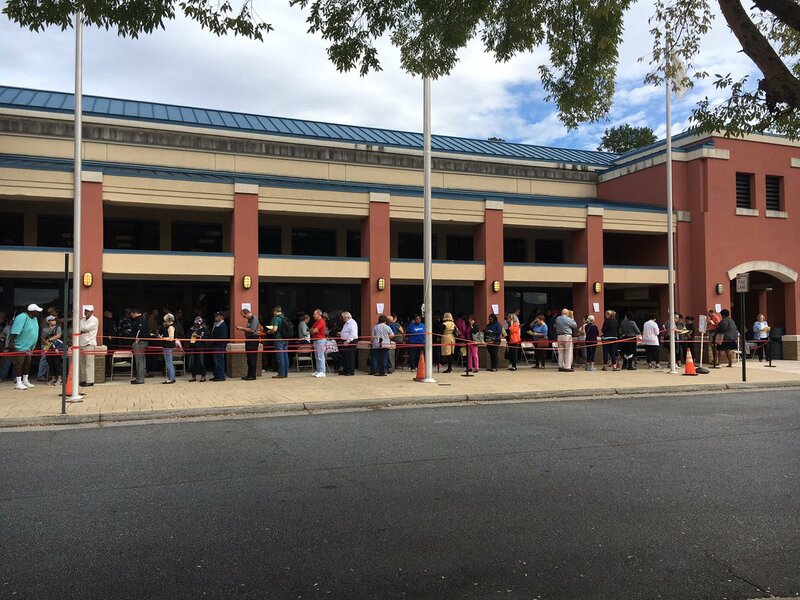 In Georgia, voters in Cobb County had to wait up to three hours to vote early in the mid-term elections. The county, which has over 750,000 people, has only one early voting site open. The race for governor in Georgia is between former state representative Stacey Abrams and Secretary of State Brian Kemp. Kemp has refused to resign his post, meaning that he is in charge of administering his own election. Kemp refuses to approve over 50,000 new registrations because they aren't an "exact match" with the information on file with the Georgia Department of Driver Services or the Social Security Administration. Kemp is effectively invalidating registrations for issues as small as a missing hyphen.